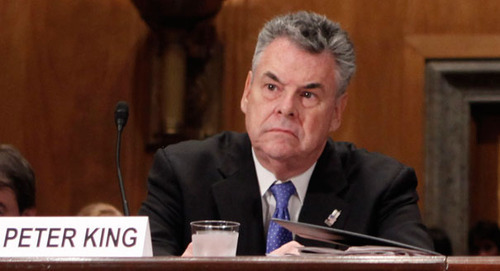 Washington D.C., USA (3:00 A.M. EST)— Congressman Peter King, Chairman of the House Homeland Security Committee, called an emergency hearing after reporting feeling “particularly sharia-ish” and “inexplicably Muslimy” last night. The seasoned New York congressman frantically reached out to his fellow Lower House colleagues, calling the situation “not obvious, but definitely creeping, like sharia.” Representative King reported to local media outlets that he woke up in a cold sweat, with positive thoughts about his Muslim doctor and grocer. The thoughts alarmed King, who stayed up through the night reading amateur blogs about some Muslims who have done bad things. “It was a frightening moment. Even after reading these fine news sources, I was asking myself ‘is that a fair perspective? What if this is just confirmation bias at work? How does this square with the numbers?’ and other shariah-type thoughts,” said King.